The flat fronted ceramic basins come in a variety of sizes to complement the classic styling of the Lansdown range. 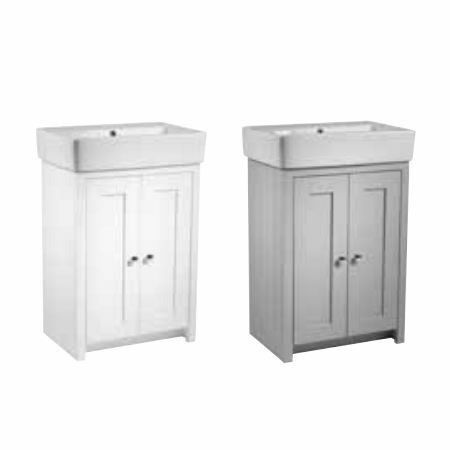 There is a wide choice of freestanding basin units, suitable for cloakrooms and family bathrooms. There is also a semi-countertop basin unit which allows Lansdown to be assembled in a run with a worktop for a more fitted furniture look. All units are hand painted and feature a solid wood frame with 5 piece doors and tongue and groove feature side panels to give a classically timeless appeal. Back to wall and storage units, a mirror and bath panels complete this beautifully understated range. Lansdown units feature soft close drawers and doors to give a quiet and controlled closure. All Tavistock furniture is made from the very best quality materials and manufacturing techniques. Such is our confidence that we can offer a 10 year guarantee on all furniture units.